It's Monday and I am getting back to my work again after 9 days of holiday. At the end of the April, Japan has almost a week holiday called "Golden Week" but for me, it wasn't a golden week, it was a diamond week as I enjoyed this holiday. At the beginning of the holidays, I had a small trip at Tottori and then for next five days, I just stayed at my Japanese apartment and did nothing, except eating, sleeping and watching lots of movies on NETFLIX with some cups of Chai and lots of Indian snacks, at the end of the holiday, I watched my first movie in Japanese theatre (Avengers- Infinity War) with a bucket of popcorn and cold drinks, had a sweet dinner on weekend night with a glass of red wine. My holiday ends with lots of memories and fun, now I am back to work with a fully fresh mind and a new excitement. I am already waiting for my next long holiday in July, till then no more blogging and Instagram except weekend. Tottori, one of the beautiful city in Japan, is a tourist place and around two million tourists come to visit here every year. Tottori isthe biggest desert in Japan. Around 16 Km long desert looks so amazing with a beautiful combination of mountain, sand, and sea. Today I am sharing my experience of Tottori and things to do in Tottori. 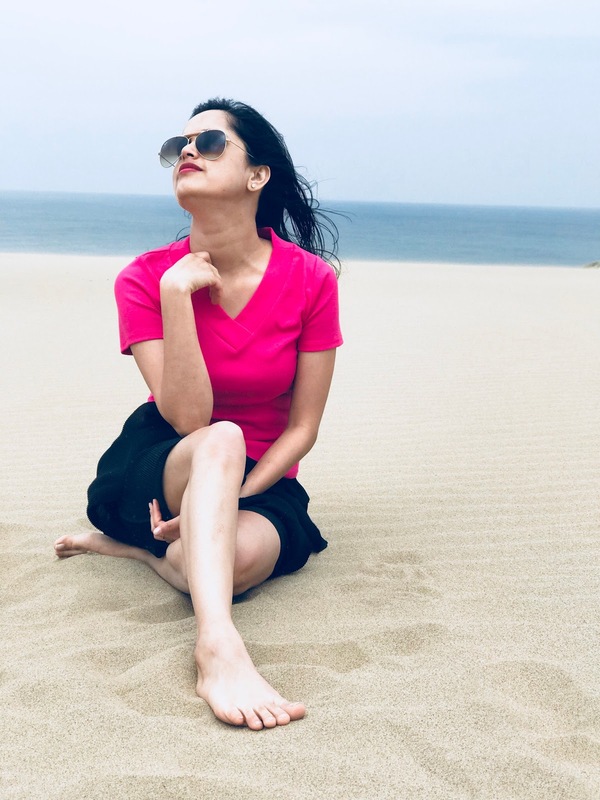 Sand Dunes- The major attraction of Tottori is its sand dune. It has a beautiful sand dune beside the beach and sea. It is the biggest sand dune of Japan, it looks so beautiful of the combination of Mountain, Desert, and Sea. I was so excited to see my first cherry blossom and share my experience with all of you. 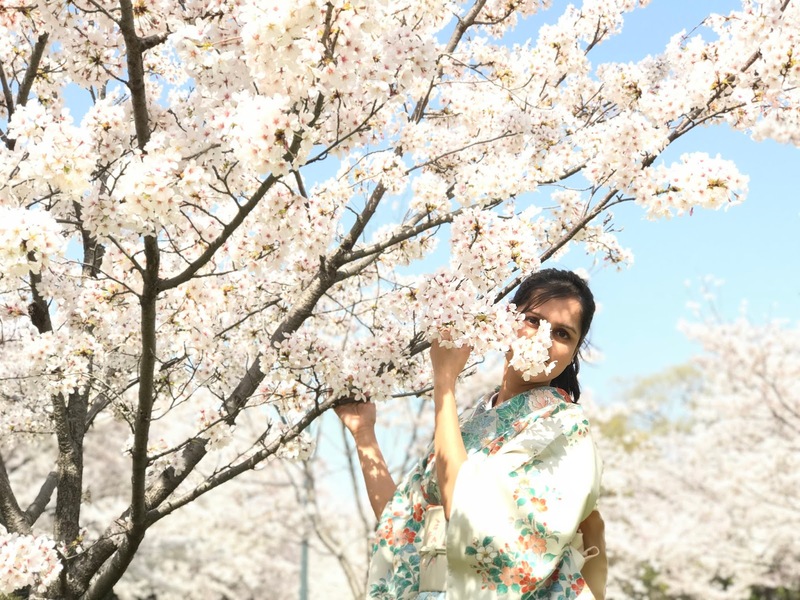 I have never seen a pink or white tree in India as we don’t have cherry blossoms, so this is my first spring and cherry blossom sightseeing. Cherry Blossom called Sakura or Hanami in Japan, and it comes in Japan only for a week or maybe two in between March and April, and after that petals start leaving their tree. Sakura is very popular in Japan and looks so beautiful when trees get white petals. Many of Japanese parks have Sakura and they look very cute. Many people go for a picnic with family or just go to hang out with friends. You can see the Blue mat to sit in Sakura everywhere. In some parks, you can find the food stall, who sells Sakura food, sounds yummy no? People go with family or friends, sit on Blue mats, eat Sakura food and have the drink, it looks so beautiful and fun. Black Huddy I love to wear a loose fit and funky T-shirt or top. This black sweatshirt with a white quotation on it looks so cute. It has a loose funky fit so it is very comfortable. I also like its length, it's quite long and it is also very light weighted and looks so vibrant with the combination of black and white. 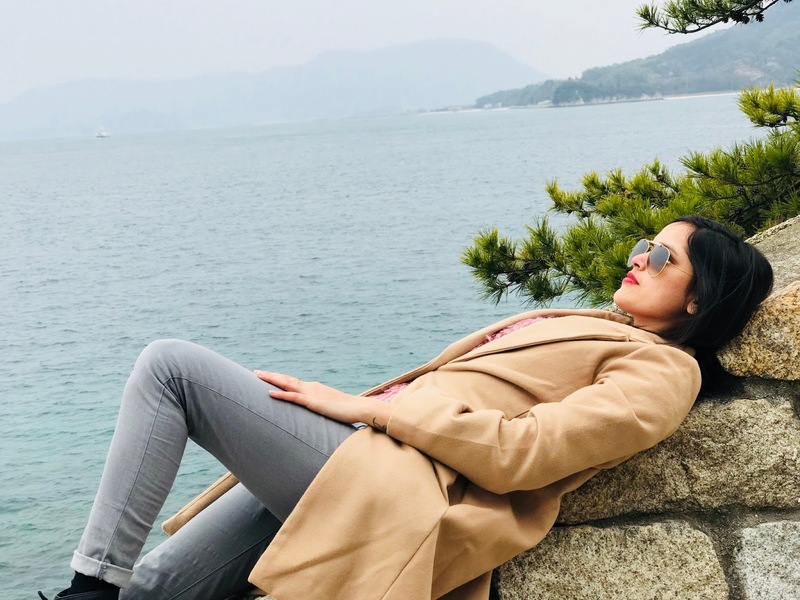 As the winter is about on an end, and the spring is almost here, it is still so cold in Japan, we can’t go out without layering winter clothes, especially when you are going to visit some Island. It feels so cold near see or on an Island. This weekend I went to visit the Rabbit Island, that day the weather was mostly cloudy, so I chose to go with pastel shades in the cloudy weather. I am wearing a rose pink color sweater with a high west gray cotton trouser and I am layering them with a beige color long coat. I really enjoy getting layered in the winter, I never bought beige color ever before, but I love this coat, so I thought it would be really good to have this coat in my wardrobe. The coat is so soft and really warm, the fitting is a bit loose but it is good to be layered from inside and also it looks so stylish, I really like this piece. I bought this coat from Zara and it costs me 11900 yen (119$). The gray trouser goes perfectly with my black boots. Rabbit Island (Okunoshima), around 47 Km far from Hiroshima Station, this is not a big but super cute island. This island has a really dark side (I am not going to touch it), but the brighter side of it is super- super cute. As per its name, the island is full with more 700 Rabbits, you can see them everywhere on this Island, just make sure to not step on the Rabbits, as they will run at you in the group when they will see you. I realized that Rabbits were more than people. You can play with them, you can pamper them and you can feed them. 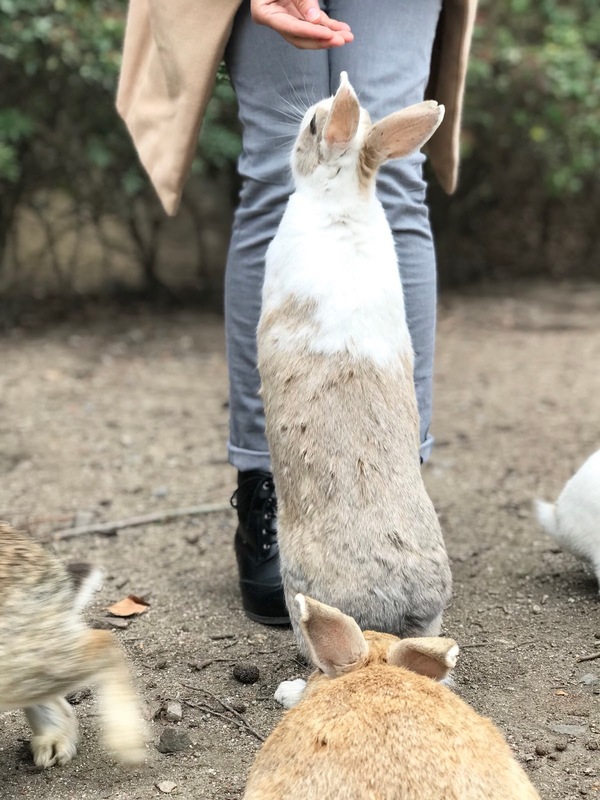 Feeding the bunnies is the best thing you can do on this Island. Make sure that whenever you got there, first buy some Rabbit food, it is available on every nearest store or shop at a very convenient price. The rabbit food costs only 100 Yen for each but it makes the Rabbit so happy, and they always expect that people have some food for them.